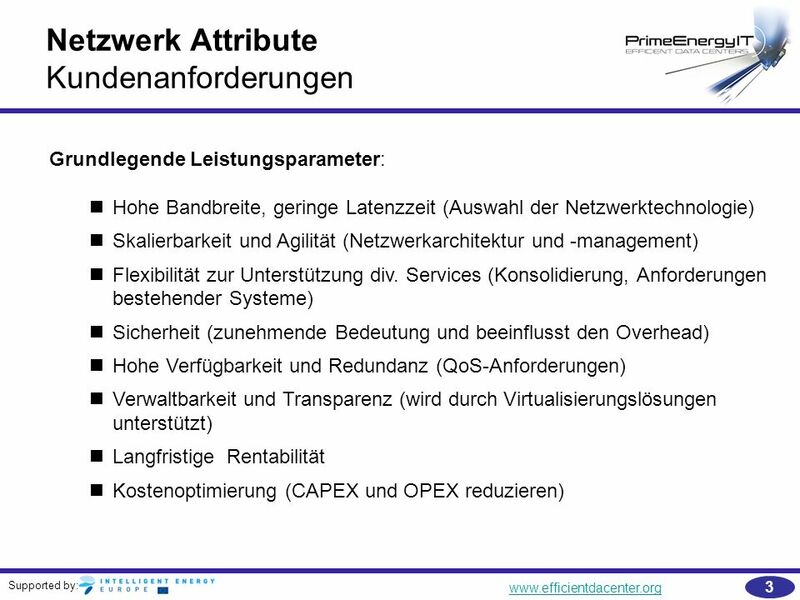 Grundlegende Leistungsparameter: Hohe Bandbreite, geringe Latenzzeit (Auswahl der Netzwerktechnologie) Skalierbarkeit und Agilität (Netzwerkarchitektur und -management) Flexibilität zur Unterstützung div. 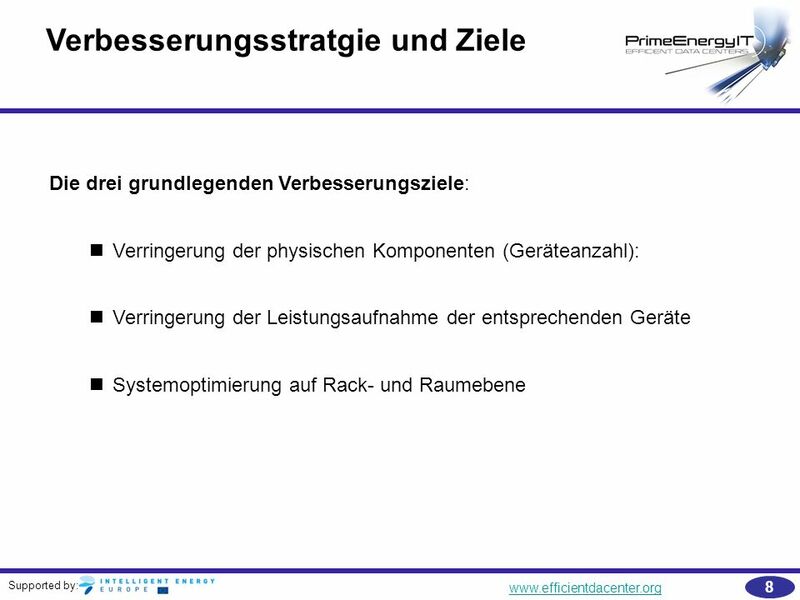 Services (Konsolidierung, Anforderungen bestehender Systeme) Sicherheit (zunehmende Bedeutung und beeinflusst den Overhead) Hohe Verfügbarkeit und Redundanz (QoS-Anforderungen) Verwaltbarkeit und Transparenz (wird durch Virtualisierungslösungen unterstützt) Langfristige Rentabilität Kostenoptimierung (CAPEX und OPEX reduzieren) The improvement of energy efficiency network infrastructure requires a structured approach. The planning for improvement starts with a strategic analysis. 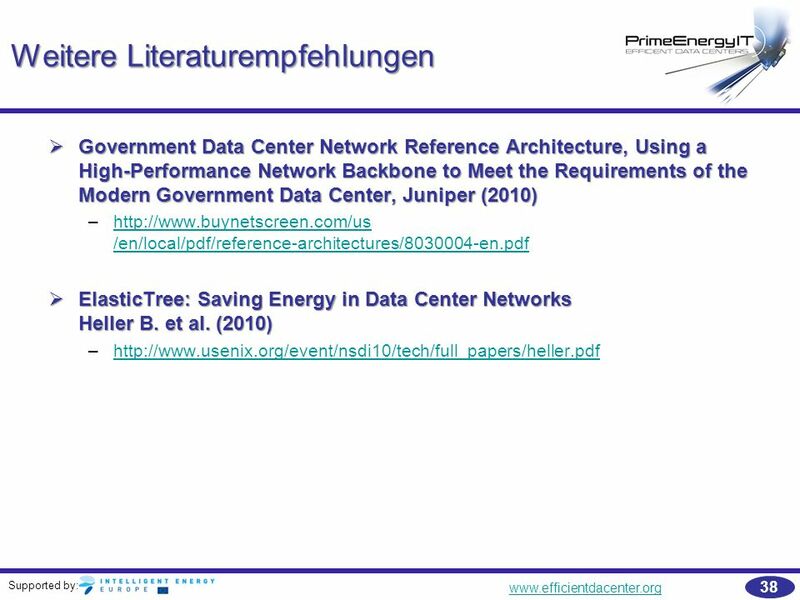 The Data Center operator needs to define network attributes and performance requirements. This task should include a market analysis. By utilizing Software-as-a-Service and Cloud Computing, applications and traffic is produced in data center and data center clouds. A necessary condition for this trend is broadband connectivity and low latency. This general trend leads not only to increased data traffic between client and server, but also to an increased server to server and storage to server data flow. 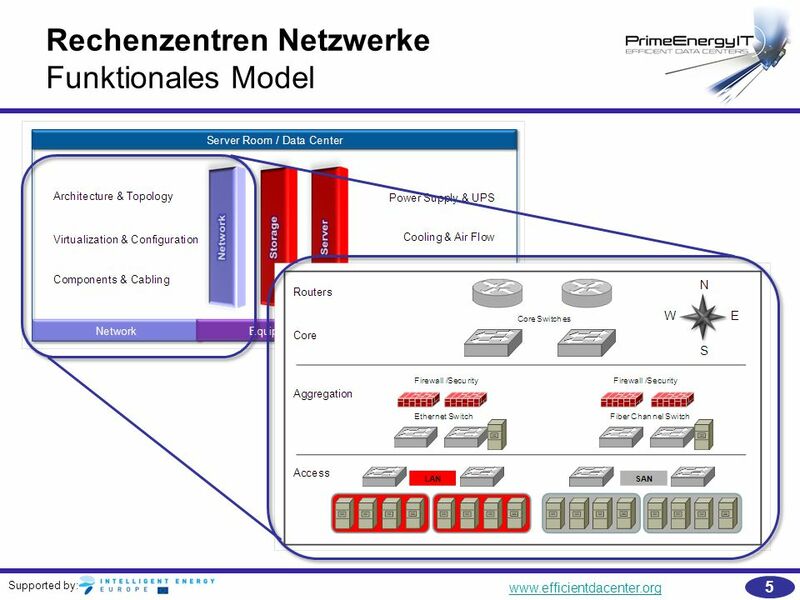 Network architecture and configuration will change in order to support the growing server to server and storage to server traffic. 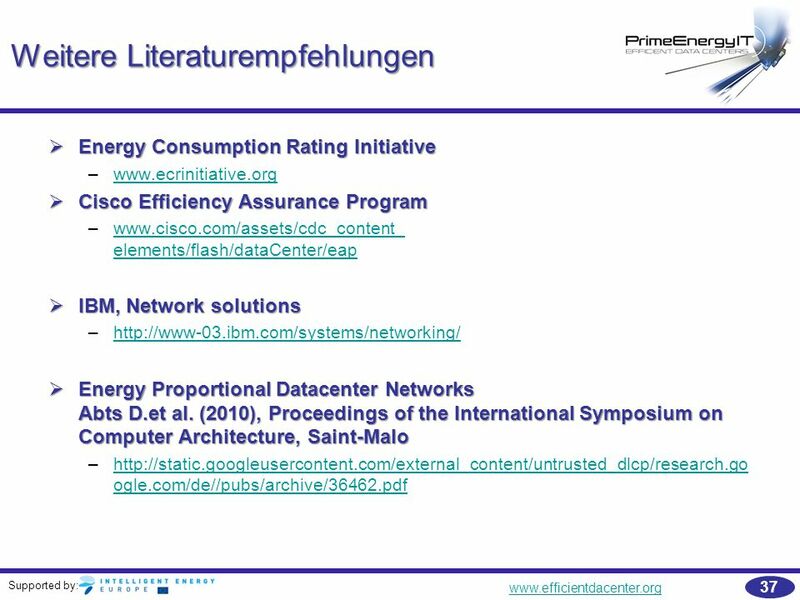 Due to the fact that there is a large variety of products and network options available on the market it is recommended that Data Center operators or IT administrators are developing a priority list with respect to network attributes. These should include network services, latency requirements, quality of service, virtualization support and other performance or interoperability aspects. 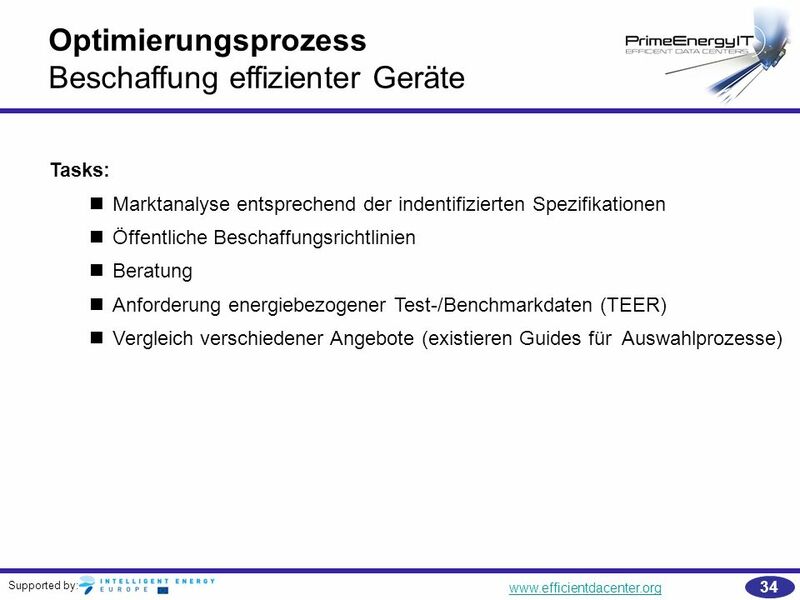 The best approach is a system optimization. 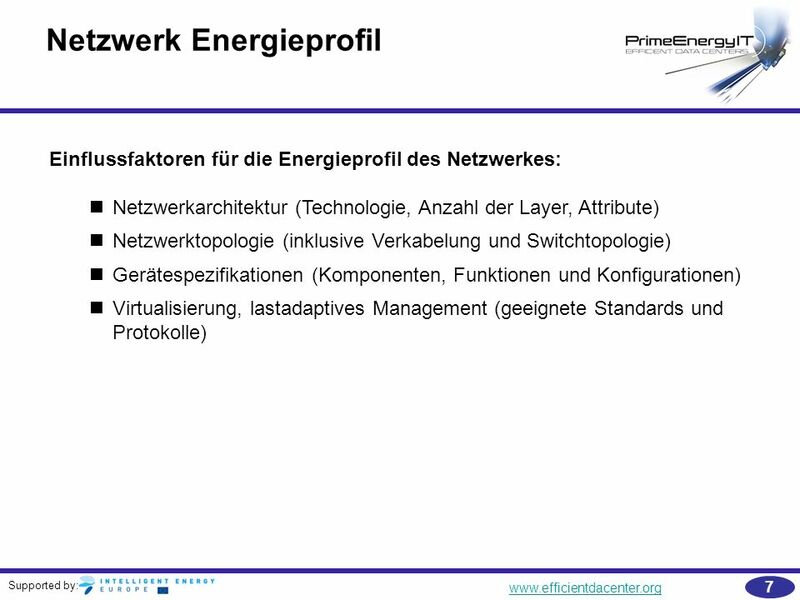 simplified functional model of energy-related aspects outlines the main elements for improvement on the network level The energy efficiency of network infrastructure and networking equipment is also influenced by the applications, service level agreements, bandwidth and latency performance requirements that have been defined by the operator of the data center. 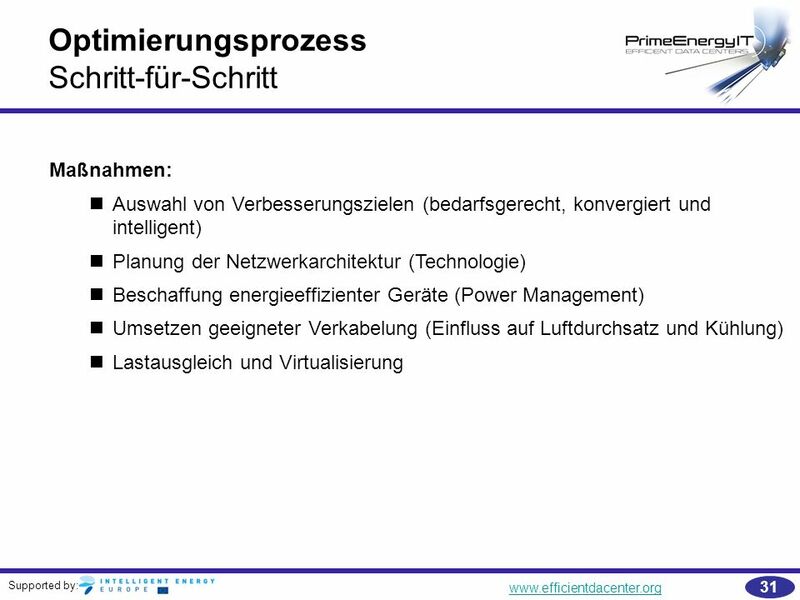 System-Virtualisierung inkl. 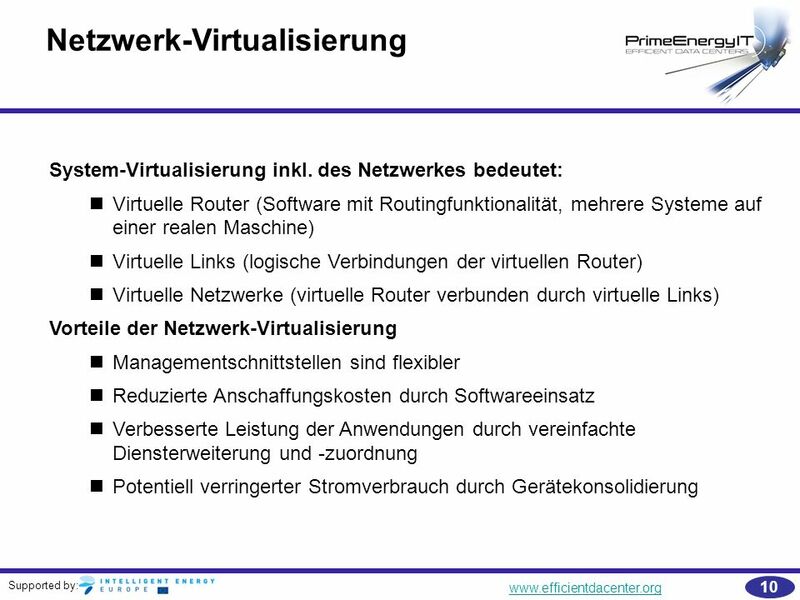 des Netzwerkes bedeutet: Virtuelle Router (Software mit Routingfunktionalität, mehrere Systeme auf einer realen Maschine) Virtuelle Links (logische Verbindungen der virtuellen Router) Virtuelle Netzwerke (virtuelle Router verbunden durch virtuelle Links) Vorteile der Netzwerk-Virtualisierung Managementschnittstellen sind flexibler Reduzierte Anschaffungskosten durch Softwareeinsatz Verbesserte Leistung der Anwendungen durch vereinfachte Diensterweiterung und -zuordnung Potentiell verringerter Stromverbrauch durch Gerätekonsolidierung Virtualization is a well established technology to consolidate physical server with multiple virtual machines. 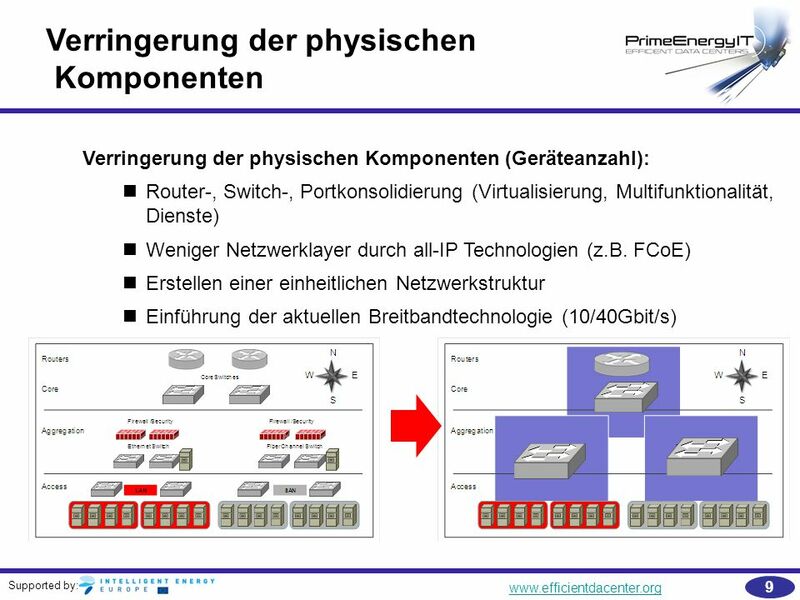 Manage network resources as logical units independent of their physical topology. The ability to configure network and port level capabilities at the individual VM level as well as dynamically tracking VMs as they move across the data center are important for an efficient management of virtualized environments. 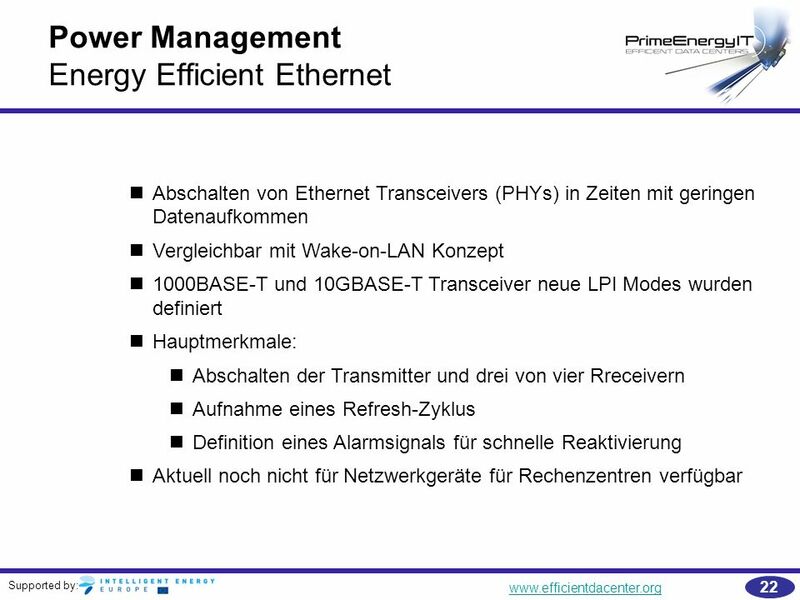 Energy efficiency is mainly archived by consolidation of routers, physical adapters for I/O ports, and additional hardware for specific network services. 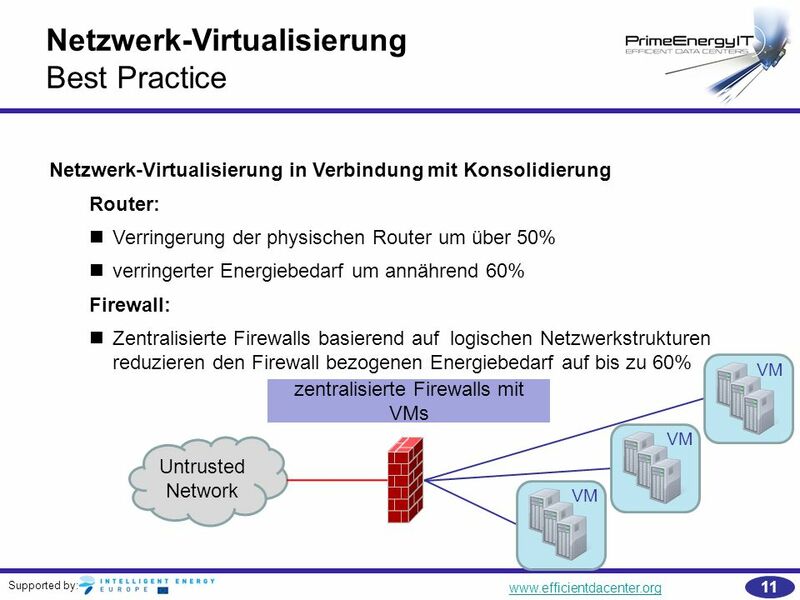 The virtualization of a firewall module or IPS by providing a software image to different applications via single network hardware would reduce the need of separate devices by utilizing the software in the same hardware. 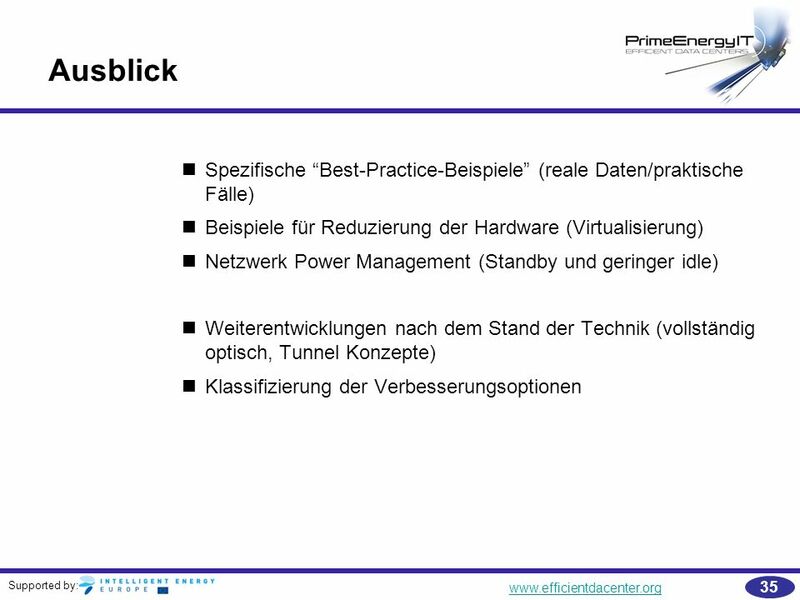 The full implementation of server virtualization requires appropriate network equipment, which is virtualization ready. Obsolete networking switches are not aware of Virtual Machines (VM) and this exposes the risk of service outage and security breaches due to incorrect network configuration. 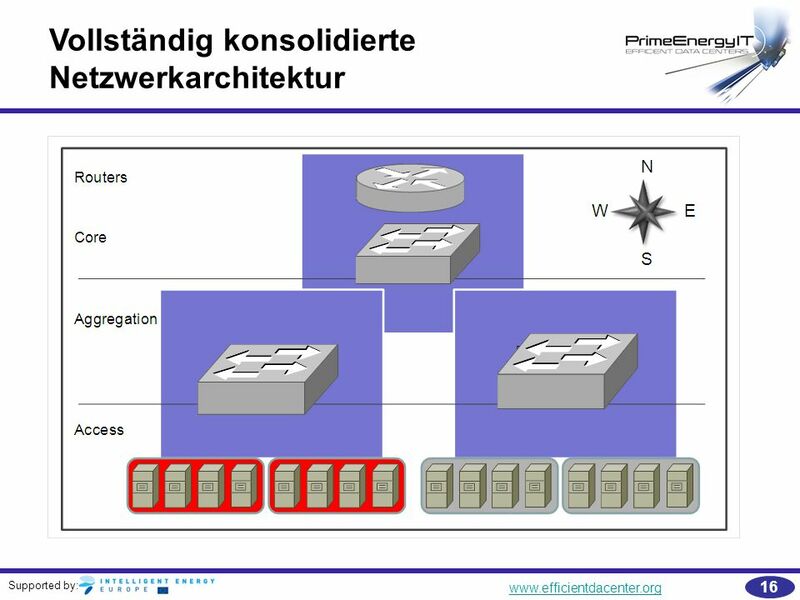 Larger picture: This slide describes a flat network architecture and the overlapping aspects of from north-south and west-east perspective. 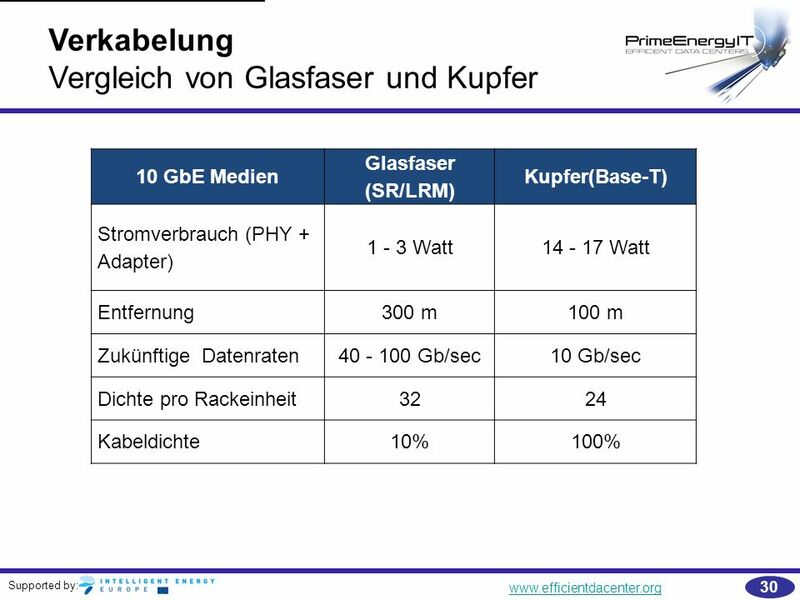 Smaller DC do not have necessarily a aggregation layer. 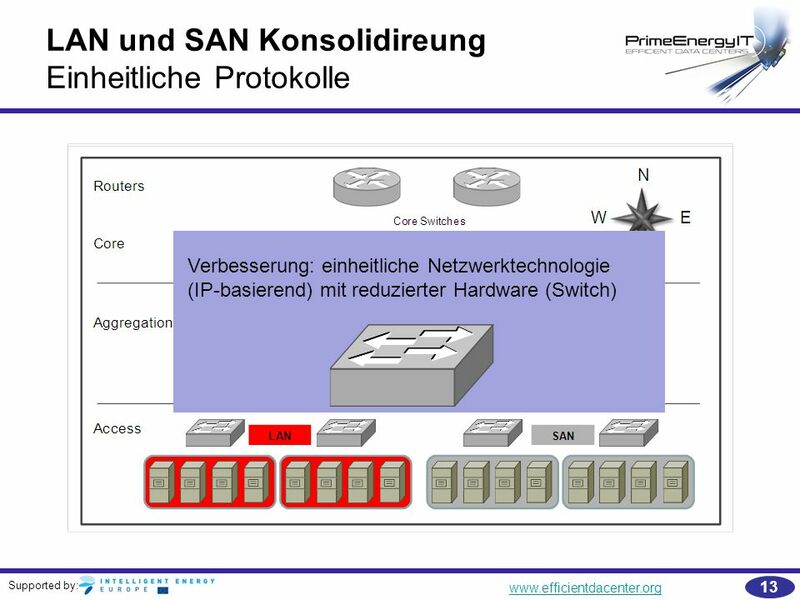 The left side of access layer shows LAN and left SAN. 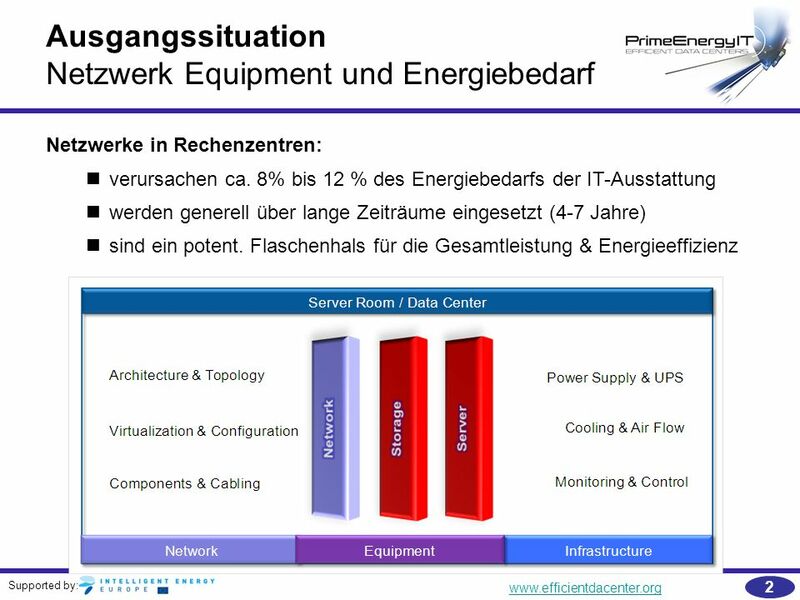 The convergence of the server (LAN) and storage (SAN) networks is a general trend with energy saving potential. 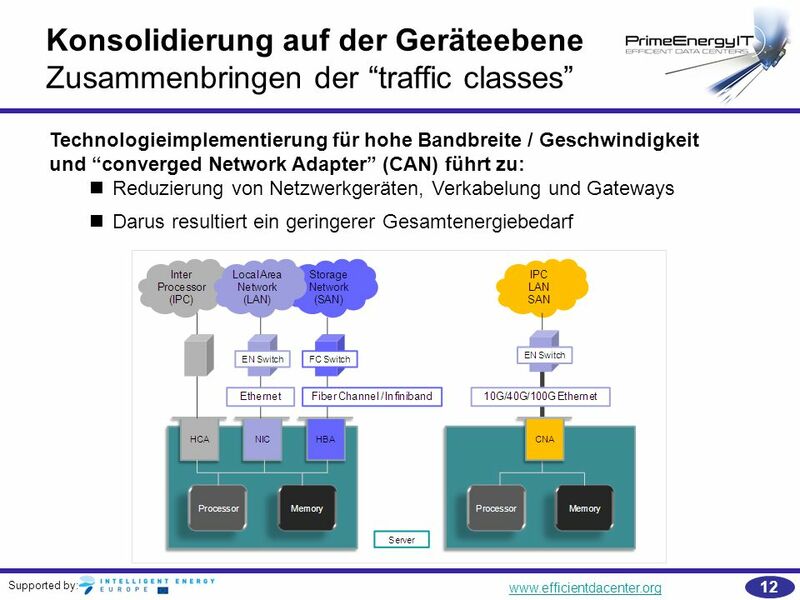 The maintaining of two separate networks increases the overall operation costs and power consumption by multiplying the number of adapters, cables, and switch ports required to connect every server directly with supporting LANs and SANs. 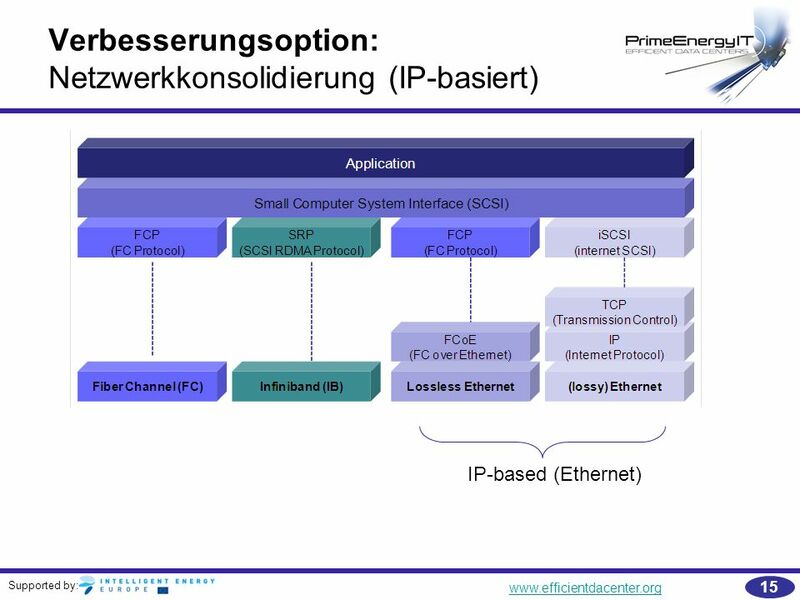 To simplify or flatten the data center network structure, converged networking technologies such as iSCSI, Fibre Channel over Ethernet (FCoE), and Data Center Bridging (DCB) are currently being implemented in data centers. 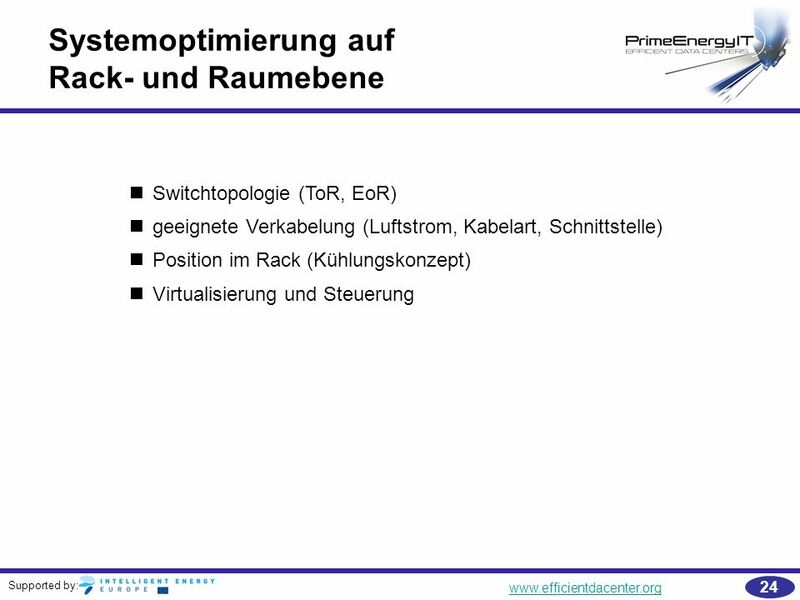 Top-of-Rack (ToR) switching is a new networking approach that has been developed in conjunction with densely packed blade servers, high performance computing (HPC), virtualization and cloud computing. 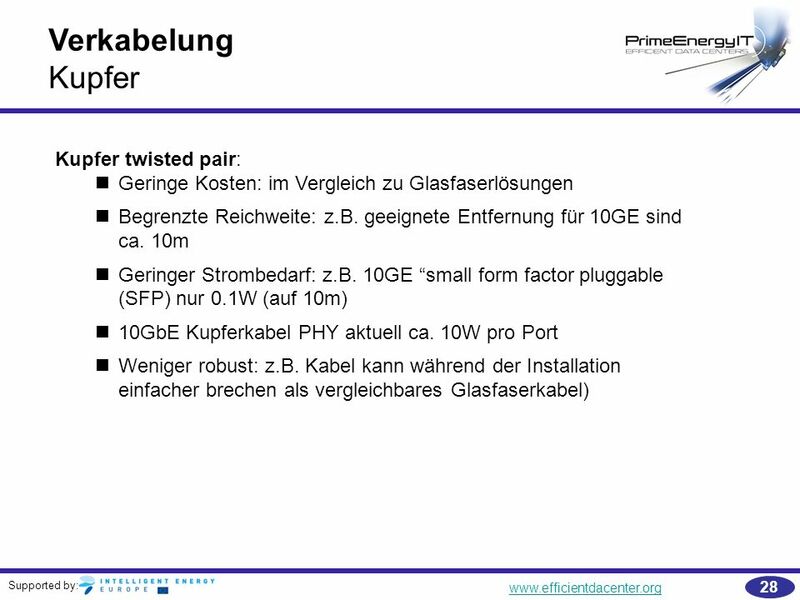 The ToR concept reduces with decentralized and resulting one uplink the cabling efforts on the aggregation layer. 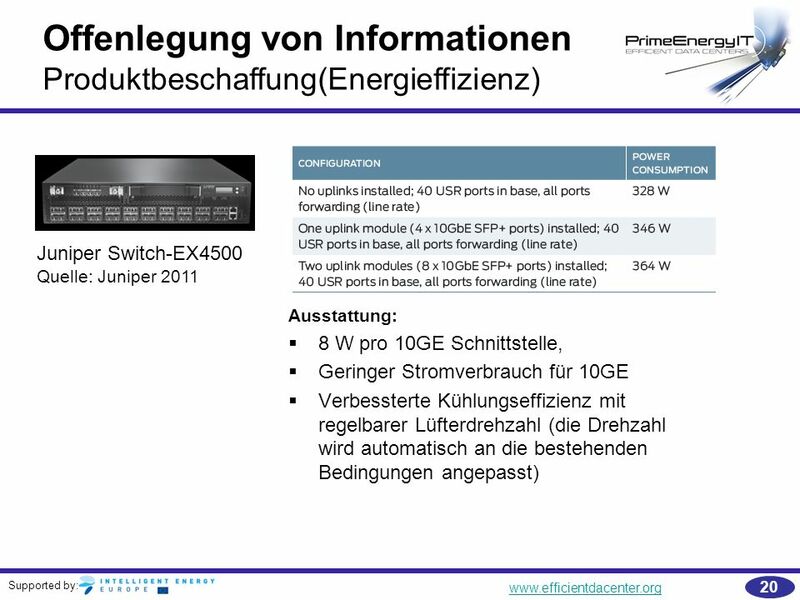 This has the advantage of fast port-to-port switching between servers within the rack. 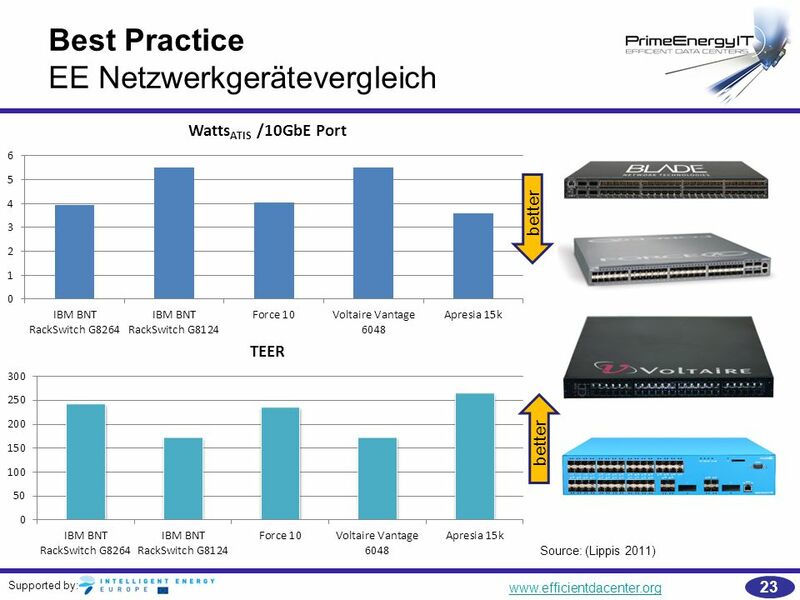 With this excellent networking performance, ToR switching not only supports high performance computing but also Data Center Bridging (DCB) and therefore the migration towards (lossless) Converged Enhanced Ethernet (CEE) or a fully integrated Data Center. 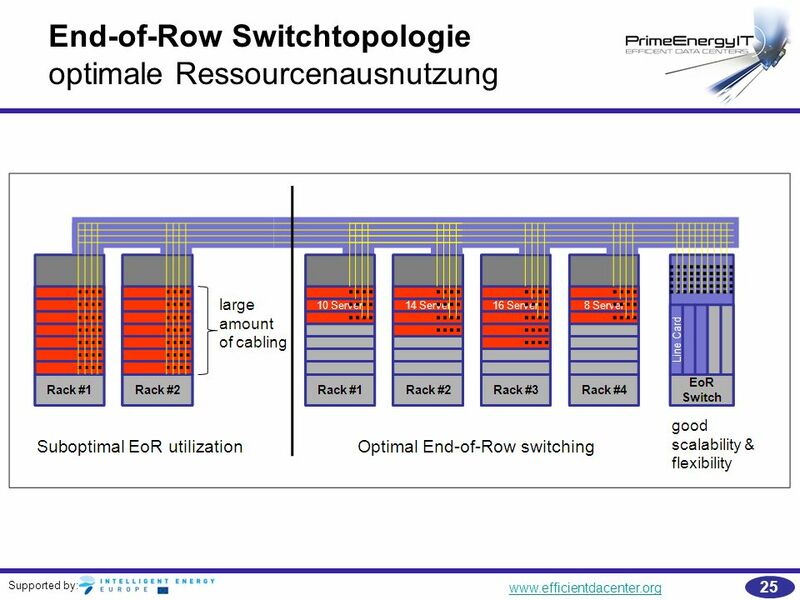 Top-of-Rack (ToR): each rack have a dedicated switch Advantage: Decentralized switching for dense server environments (I/O consolidation) whicg reduces cabling effort. 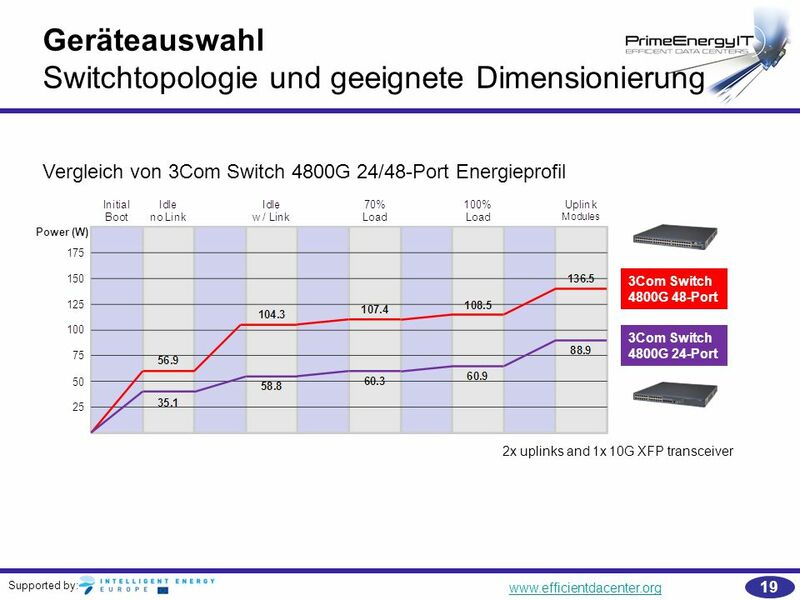 The shorter cabling distance between server and switch improves transmission speed and reduces energy consumption for this transmission. 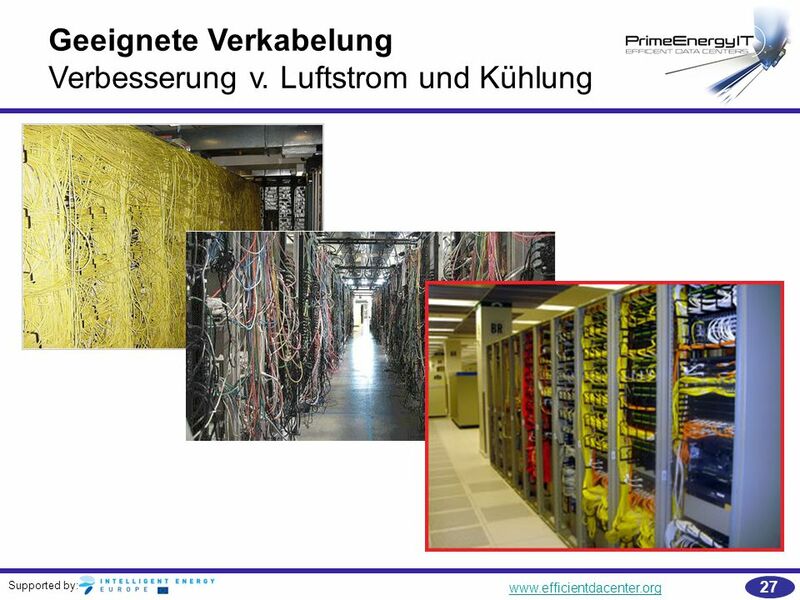 Disadvantage: If ToR is utilized in less dense computing (few servers in a rack) the system is over-dimensioned. 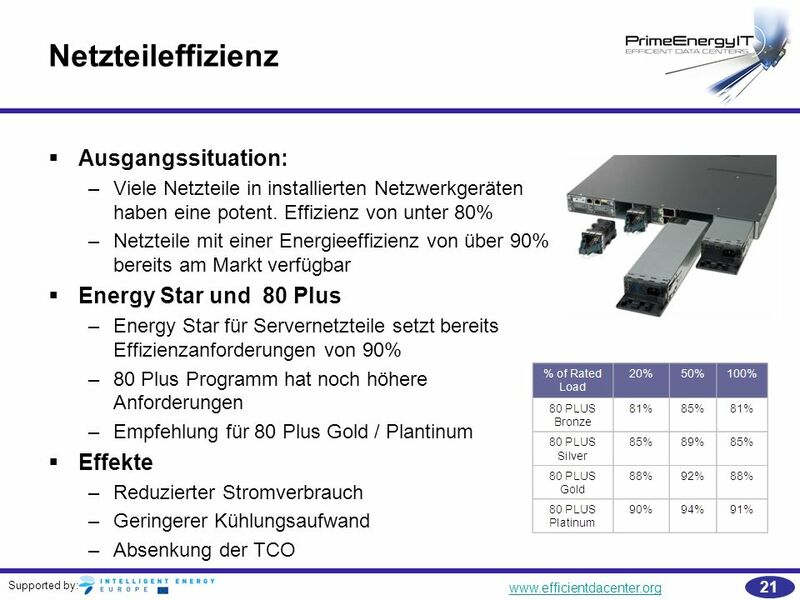 Energy efficiency is low due to suboptimal utilization of available ports. 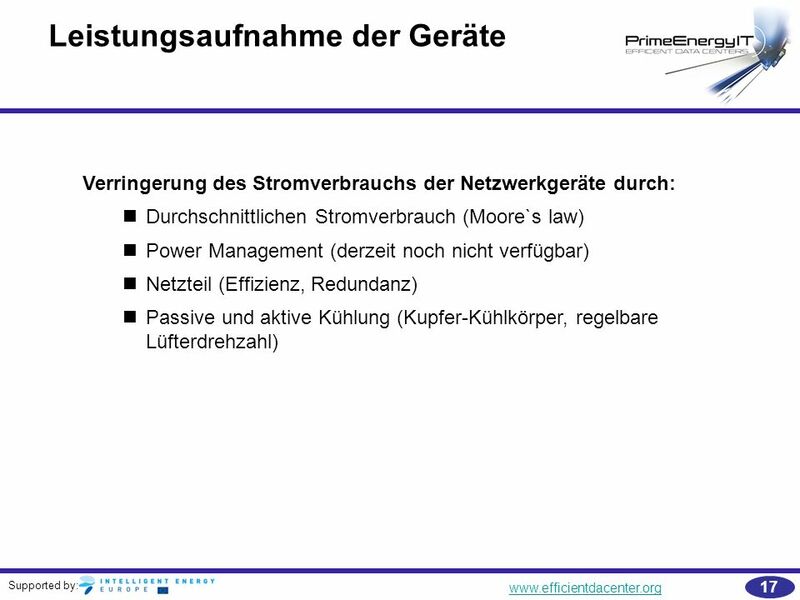 Auswahl von Verbesserungszielen (bedarfsgerecht, konvergiert und intelligent) Planung der Netzwerkarchitektur (Technologie) Beschaffung energieeffizienter Geräte (Power Management) Umsetzen geeigneter Verkabelung (Einfluss auf Luftdurchsatz und Kühlung) Lastausgleich und Virtualisierung Setting of improvement targets: according to overall server room / Data Center concept (eg. 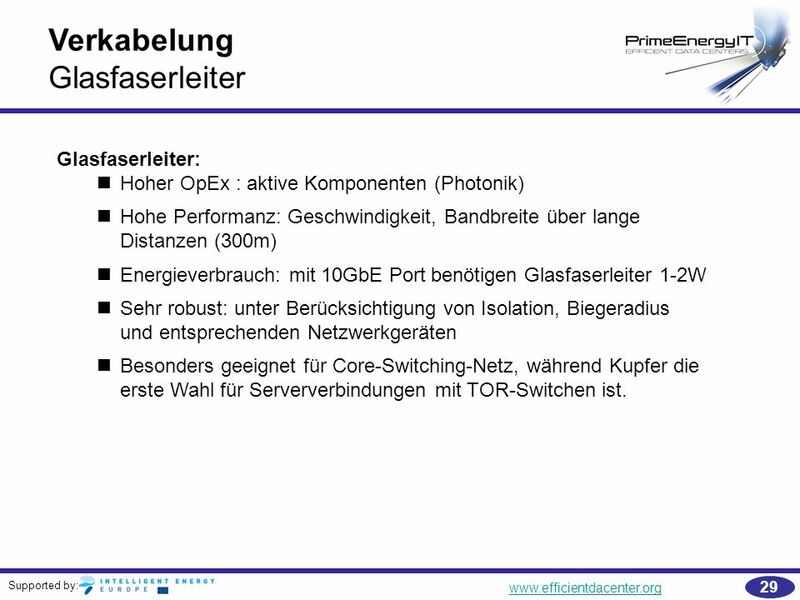 cooling, rack housing, power supply, SLAs What is the overall situation? 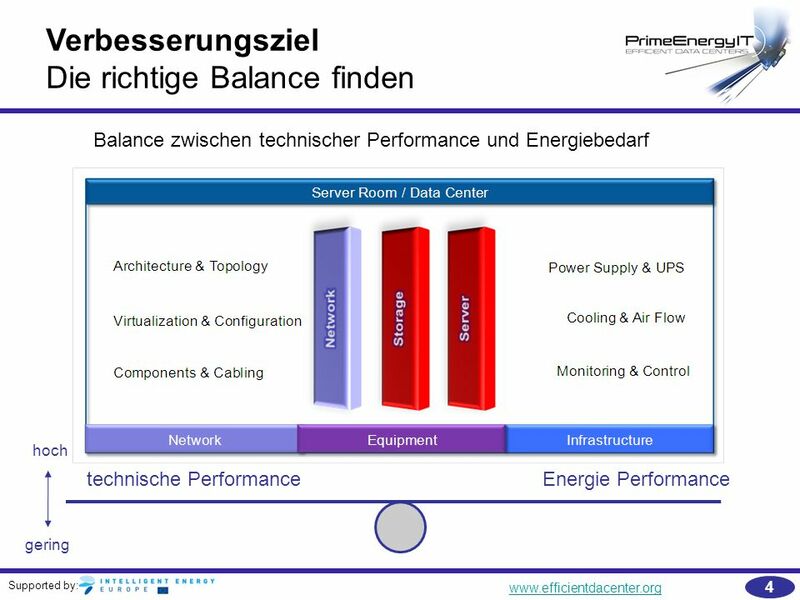 Simple upgrade of equipment / Extended changes in the infrastructure or completely new data center build-up Planning of network architecture: in accordance with future performance parameters and the overall situtation (see also slide 3 network attributes) performance parameter have to be transferred into technical parameter (eg. 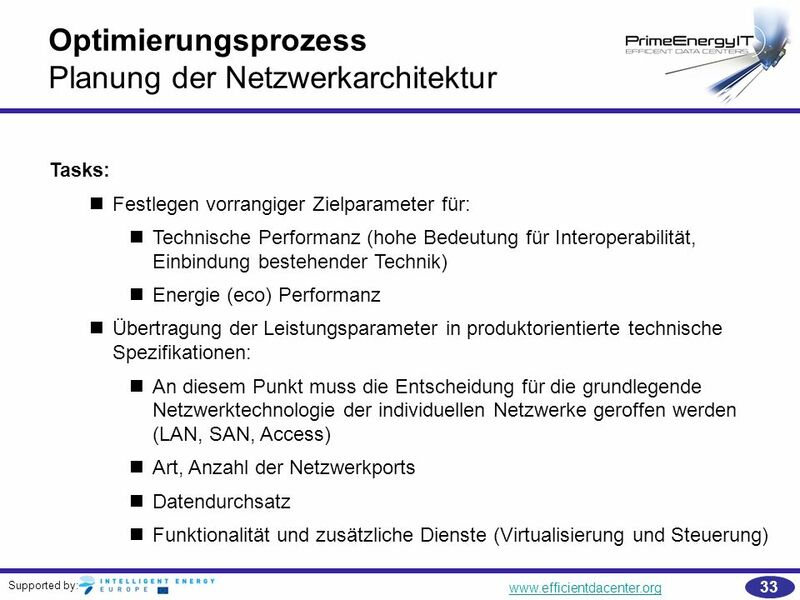 network ports, data throughput…) At this point a decision has to be made on the basic network technology for individual networks (SAN, LAN , Access) and their performance parameters. 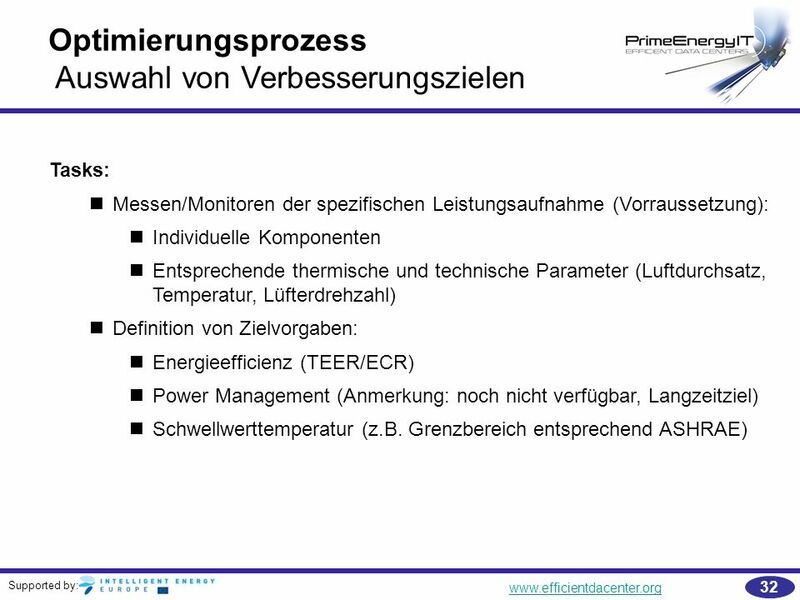 Procurement of EEE: Create a list of technical specifications for equipment that needs to be purchase. 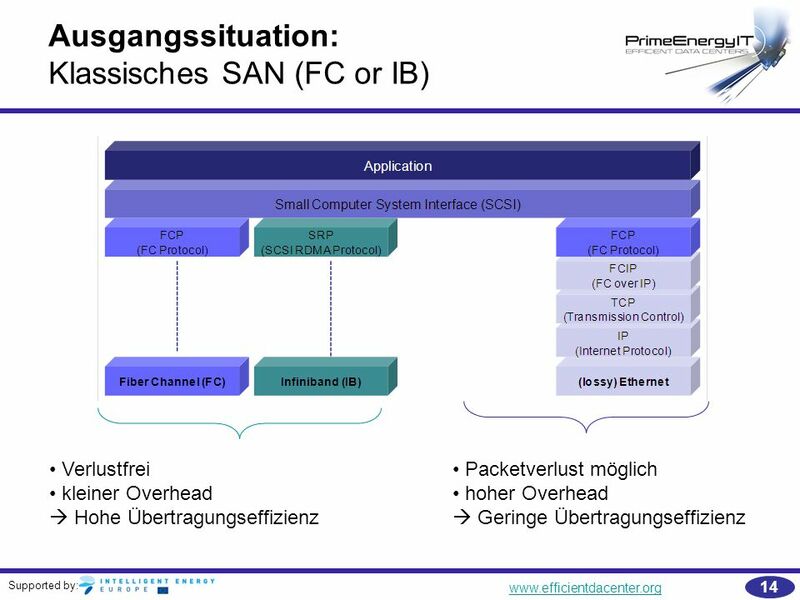 Regard aspects like: What kind of network technology is the choosen standard for LAN and SAN? 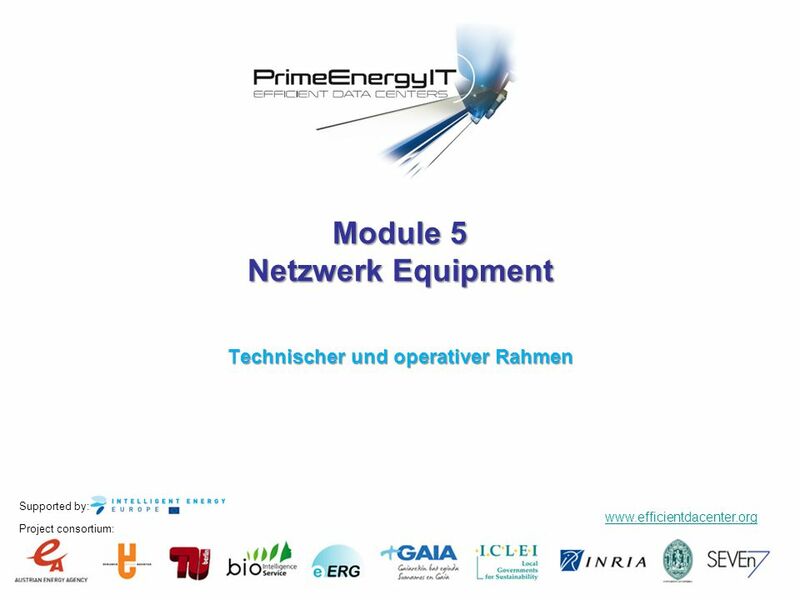 Equipment and cabling. 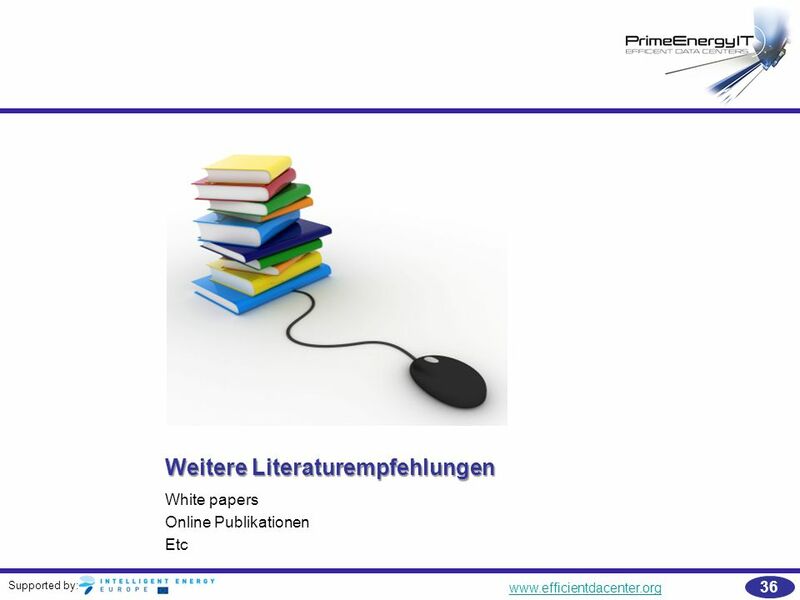 Herunterladen ppt "Module 5 Netzwerk Equipment"
Vorlesung: 1 Betriebssysteme 2008 Prof. Dr. G. Hellberg Studiengang Mechatronik FHDW Vorlesung: Betriebssysteme Hochverfügbarkeit (Einführung) 2. 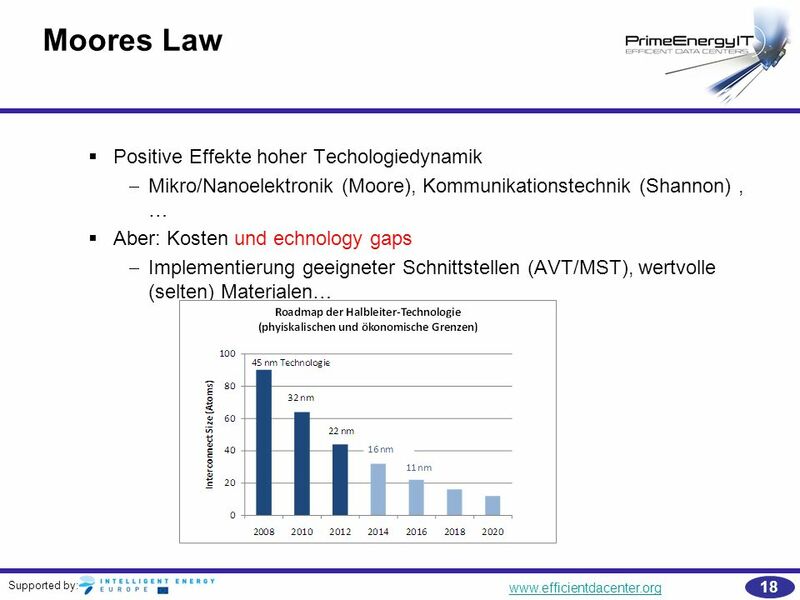 Quartal. 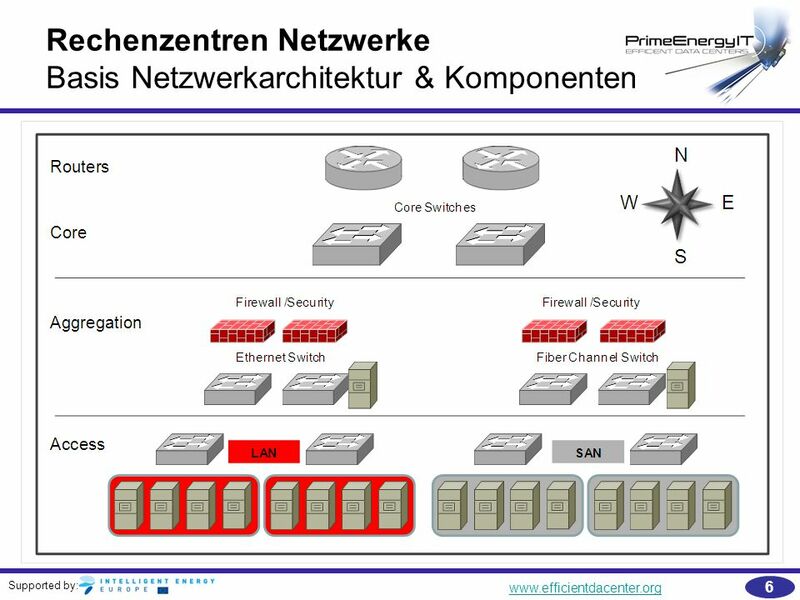 Universität Heidelberg Rechenzentrum Hartmuth Heldt Sicherheitskonzept - Netzwerk 1.